Stories give us a strong connection to our family and heritage. Stories also provide us with a connection to times and places that are far away or people we would like to know better. Take time to share your stories. 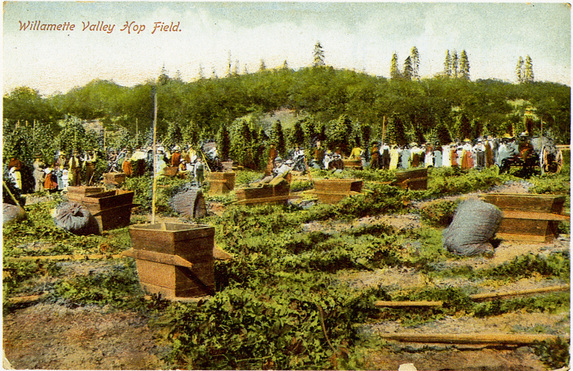 Willamette Valley Hop Field in the 1920's. From the collection of Steve Schreiber. Wire Down: Memories of the Hop Harvest as told by Mollie Schneider Willman. Compiled and edited by Vickie Willman Burns. The Steinfeld Story by Ray Steinfeld, Sr.
Marilyn Schleining Schultz interviewed by Heather Viets on November 16, 2016. Loretta and Harold Kammerzell interviewed by Heather Viets on November 28, 2016. Roy Conrad Derring interviewed by Heather Viets on December 4, 2017. Click here to read the interview transcripts for Marilyn Schleining Schultz, Roy Conrad Derring, and Loretta and Harold Kammerzell.